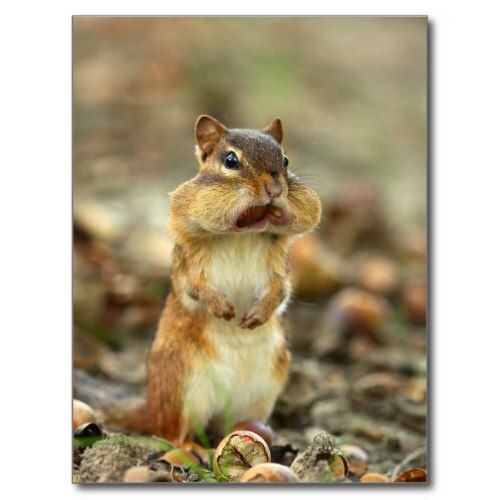 A funny, hilarious, custom photo postcard, featuring a chipmunk posing with his face stuffed with nuts, looking every bit like Po from Kung Fu Panda 2, declaring "38 Bean Buns..." to the Furious Five. A funny photograph from National Wildlife Federation, taken by Peggy Hanna, of the chipmunk gathering nuts for winter stockpile. Makes a fun mail to kids, grandkids, animal lovers, wildlife enthusiasts, nature lovers, zoologists, Kung Fu Panda fans, fans of Po, friends and family.